The lake had fished very well though mudeye hatches have not been as big. Fish were still coming in around the edges on the weekend and some cracking rainbows amongst them. The lower end of Crowe's round through to Seven Gates have been very good areas, but Yens, Old Adaminaby and Anglers Reach have been producing some reasonable numbers. Fish have been onto them most of the time and there are some great quality fish to be found. There have been a few, not many but a few rainbows pushing 2kg. Most of the fish are averaging 800gm - 1kg and are in excellent condition. Any of the standard streamers will work at present. Evening fishing with Muddlers and Mudeye patterns are generally the best. Beadhead nymphs have been a good searching pattern in deeper water during the day. Best areas are Yens, seven gates, Rushys, Middlingbank. Best Flys Mrs Simpsons, Hammills Killers, Black Muddlers,B/H Black Nymhps. so if your up there fishing any time send us a Report. Rivers:-The river fishing has been great in the streams. Still good water in all the high country rivers and streams, and plenty of hungry fish. The Thredbo has been very good with from the Diggings area. Browns in the 1 - 1.5kg range have been caught with Nymphs below a Humpy proving very effective soon. the browns will do there run soon fishing downstream from the bridge will be worth a look. Had a great day on the Bidgee "guiding" my dad. Just fished across and down with a bead head bugger, bead was key in the high water, and Dad was rapt to catch half a dozen of 8 to 12 inch rainbows and browns. He was even more rapt to latch onto and catch this cracking brown, His biggest yet. Needless to say he wants to get up again as soon as possible. (3 March)...Well I did, and it didn't stop raining from that weekend and well, majority of early March. So it didn't get much use other than a new spool of backing and line. Anyway, managed to get out to the Cotter River in Canberra and pick this beauty up! The drag got a work out once the fish realised it no longer wanted to stay in that particular pool and raced off down stream! It sized out at 38cm my biggest out of the Cotter River, my biggest on fly yet. Thanks again for the recommendation to my old man for the birthday gift. 6PM until the fish went off the bite around 9PM. A final tally wasn’t kept, but if one member of the party has gone a little softer they may have reached double figures in fish to hand rather than the few they landed. Each of us at one time or another suffered a bust off or two on better fish. As for successful flies it didn’t really matter too much what you had on if you put in front them it was eaten. PS; Sorry no pics we were too busy fishing. 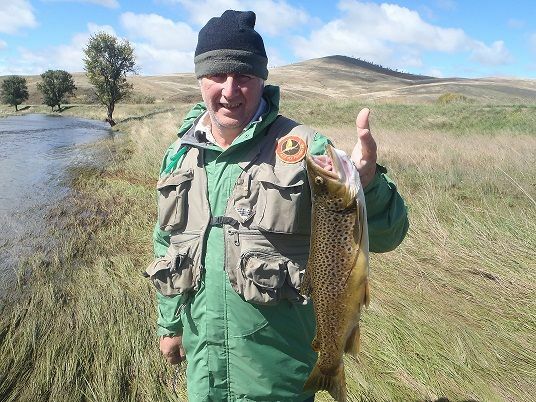 grubs have been picking up some good Browns around seven gates and old Adaminaby the Mudeyes have been working very well at seven gates, old Adaminaby, Anglers Reach and the Dam wall Power Bait hase been picking up some Nice Rainbows as well Middlingbank and seven gates. best areas are seven gates, Dam wall, Remember if your not getting fish after an hour or so move. Best areas are Seven gates, Dam wall, and Old Adaminaby. please remember if you are fishing at Seven gates Do the Right thing remove all rubbish. "So if your going fishing this weekend seven gates is my pick"
Bait Fishing Jindabyne:- bait fishing has been a little slow so pick your spots where you go find the weedy banks around Kalkite, Kalkite west Bay, and down at Hayshed Bay. Best Lurers are Tassie #Y48,55,Y36,19,103,104,Y62,27,Y36,strike pro Blades rainbow Rapalas, X-raps, don't forget about the new Tassies when your in the store. Best areas to try would be Collingwood, Coppermine, and Angler's Reach, seven gates.